The rage of young people has exploded in every corner of the country. Marches and occupations of faculties have taken place on an historic scale, roads, station and ports have been blocked, and clashes with the dogs who guard the bosses have taken place. It’s been a thunderbolt from a serene sky which seems to have started a new cycle of struggle in the universities. Florence was the catalyst, with the decision of the undersecretary to the President, Daniela Santancha, to hold a racist conference at the University of Novoli. Hundreds of students were quickly met by police who prevented them entering the University. Barricades were quickly constructed in Guidoni street and at other strategic points to block the traffic. The Refectory was taken over. A few hours later the Faculty of Arts was occupied, joining the occupation in the Faculty of Sciences. This was the hour when those who had previously been useless and whingeing turned to action, when those who said that ‘the struggle will be hard’ turned to sample real conflict en masse for the first time, and those who sat on the fence passed in massive numbers into the cities and to radical action. It was the hour when those who shouted ‘your repression doesn’t scare us … our struggle will become ever more intense!’ were attacked by the police and clubbed around the head, escalating the conflict and throwing up barricades. 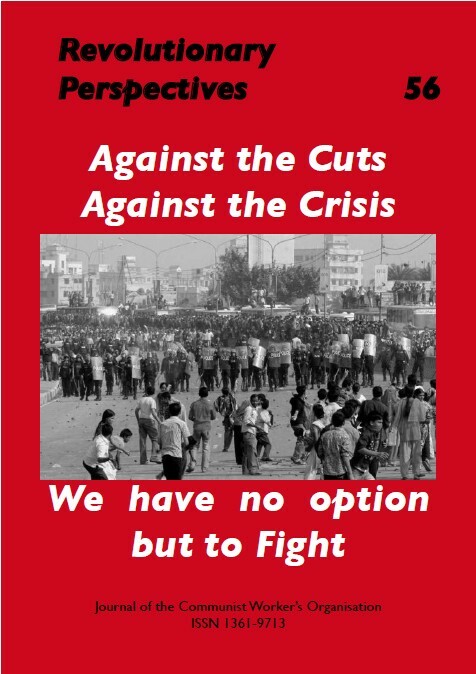 It was the hour when those who shouted: ‘We will not pay for the crisis’ indeed started to refuse to pay for it. The potential of the conflict of the demonstrations on Thursday has not been exhausted, but has multiplied; from the demonstrations at the sit in at the Refectory of San Gallo the day after, to the spontaneous street blockades which followed this initiative, and in the tone of dozens of assemblies which have been organised. By Saturday the movement had captured media attention with a banner unfurled on the dome of the cathedral, by Monday it had shown it’s capacity and determination to blockade the railroads of Rifredi station for 95 minutes, leading to delays and cancellations for 15 high speed and 25 regional trains. 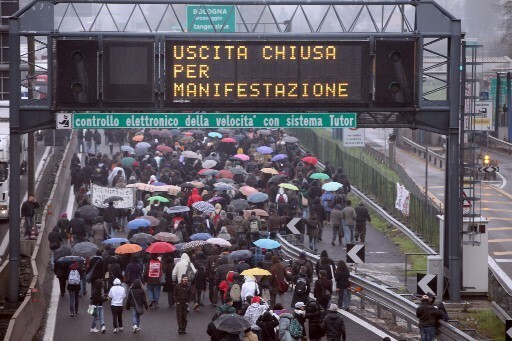 On Tuesday, the day on which reforms were discussed in Parliament, a march left from a meeting of 200 students with one clear intention: to occupy the motorway and try to block the flow of goods and break Italy in two. At the end of Guidoni street the police put up obstacles between us and our objectives. Opposite the barriers were hundreds of students, faces covered and wearing crash helmets. The massive deployment of cops stopped them reaching their objective. Meanwhile thirty ‘pacifists’ positioned themselves between the demonstrators and the police, believing that simply ‘democratically’ holding up your hands is all you need. For them self-defence is just a display of violence and lawlessness. Over the course of these few days the distance that separates the two halves of the movement was drastically revealed. On the one hand there was a replica of the Wave (Onda) that was still caught up in a media obsession, looking hopefully to politicians and trades unionists, it was confined to the student ghetto and incapable of seeing anything beyond the ‘world of education’. On the other hand the direct expression of anger from schools and universities led students to demonstrate on the streets with an impetuosity which derailed the old bankrupt, limiting and frustrating confines of the ‘protest’. The blockades, the sit-ins at the Refectories, the occupations and the barricades show a determination fed from frustration and restlessness about the present system and a future where prospects seem worse and worse. As a result, the following day’s newspapers were just concerned with ‘creating a good impression’ and one clear message rang out: “We will stop this”. The speeches and discussions in parliament showed how the technicalities of reformism can be overcome in one second flat, being replaced instead with a generalized attack by our masters who are intent on imposing ever worsening living conditions on us, even though those we have are hard enough. It’s becoming more and more obvious how the crisis is revealing the line which divides society between those who exploit and those who are exploited, and how the former are determined to profit from the lives of the latter. This is integral to the movement, and after a small victory has been snatched from the struggle, reforms are pushed back indefinitely so the decision to re-launch an extended mobilization which expands political horizons both physically and over time must be taken. The idea of the fall of the government and an eventual change of power will not be enough to satisfy those who attempt to oppose once and for all the forces of a parliament who want to stop the class struggle, since it only has one interest; the defence of profit. As a result a debate is emerging on the necessity of a general strike to bring the economy to its knees for one, two days or even indefinitely. Amongst those carrying out the occupations the need is emerging for a new way of struggling which is born from individual consciousness and which is stimulated by the collective experience through selfmanagement of the fight. This climate has prevented attempts of several student organisations from imposing themselves as the single leadership of the movement or inflicting decisionson it to suffocate every attempt at real autonomy. Now it’s time to choose, whether to develop and organize this tendency with all it’s contradictions or become exhausted in the umpteenth student movement. This doesn’t mean having the choice between a level of struggle and another of communication, but to rethink the objectives of the struggle and methods and places ofcommunication. We believe we’ve passed the time for demonstrating through the streets of historic areas, being snapped by tourists with the demonstrators searching for symbols to attack (such as the bosses organisation, the police etc), all of which reduces the conflict to a mere spectacle. We do not delegate the spreading of our message to the media, which will only allow the ‘nightmarish Black Bloc’ (i.e. police agents provocateur) in order to criminalise all the expressions of the radical struggle of today’s national movement. We bring our anger and our voices directly to the streets. We believe we are at the point of taking control of the times, means and spaces that are necessary for our struggle; we are talking about the Faculty of Arts Occupation (already a meeting point and political laboratory for school kids, students and young people united through sharing the same journey, open to unite with each other), we are talking about leaving schools and universities and the usual places to meet workers and people in the spaces where real metropolitan city life is lived, where the mystifications and false feelings of wellbeing are going to be brought down. We do not claim to be making anyone aware of the problems that they already experience, simply to open up the possibility of an autonomous encounter that possibly leads to concrete solidarity and the possibility of spreading effective action. The time has come to face the contradictions, to make clear our real perspectives, to continue publicly the debate that we want to open here with this document (here in Florence we are looking at the experiences in other cities). This is the moment to take a stand.